The idea of using your Mac like a free-form tablet or sheet of paper isn't new, but ways to effectively make that happen are few and far between. 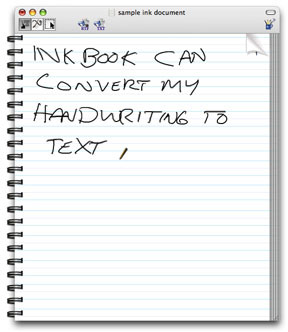 inkBook from Mage Software does just that, and it actually works. 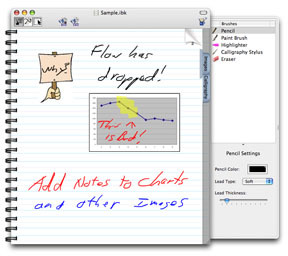 inkBook takes advantage of the Ink technology that's built into Mac OS X. With an Ink-aware input device, like a Wacom graphic tablet, you have everything you need to get started using your Mac as a digital Big Chief tablet. I used a 1.67GHz PowerBook G4 and a Wacom Intuos 2 tablet for my tests. inkBook was responsive and rarely lagged behind my writing. I did, however, occasionally forget that I had handwriting recognition turned on in the Ink Preferences Pane, which meant that my stylus wanted to act as a pen first and pointing device second. Not a big deal, but it did slow me down sometimes when I couldn't use my stylus instantly to click and drag items. If you prefer to keep your inkBook notes in inkBook, that's okay, too. You can search through your documents with the app's built-in Find command. If you are looking for an alternative to your Mac's keyboard for entering text, and you have an Ink-aware graphics tablet, inkBook is worth trying out. It is a great idea for anyone that needs to take notes, and since you can draw anything you want on a document page, it's easy to use for diagrams, too. 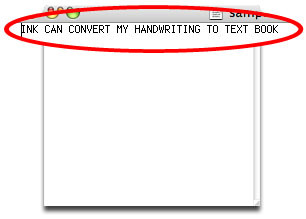 Thanks to its ability to convert handwriting to text and export it to other documents, this is one application I wish had been around when I was in school.